Remain relaxed in Consciousness. In any situation, do whatever you feel you should do without any regrets about the past, without any complaints in the present, without any expectations for the future and importantly, without blaming and condemning anyone for anything neither yourself nor the other. This will enable you to live your life, constantly connected to the Source and will give you happiness through peace of mind: SUKHA-SHANTI. 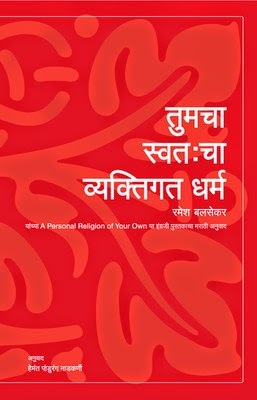 This will be your personal religion: Sukha-Shanti. Rameshji, a teacher of pure Advaita or non-duality is an unearthly blend of the utterly human and utterly divine manifesting as a brilliant spiritual Master. His crystal-clear and profound teachings are backed by his complete understanding that Nobody does anything coupled with his life experience as a top executive of a major Indian bank as a husband, father and grandfather - all lived knowing that it is all happening as Gods Will. For much of his full life Ramesh, whose Guru was Nisargadatta Maharaj has been devoted to Ramana Maharshi in whose spirit Ramesh welcomes seekers and asks Who is seeking? Leave the seeking to Him who started the seeking."